Health-conscious it may not be, but most everything tastes better fried -- including scallops. 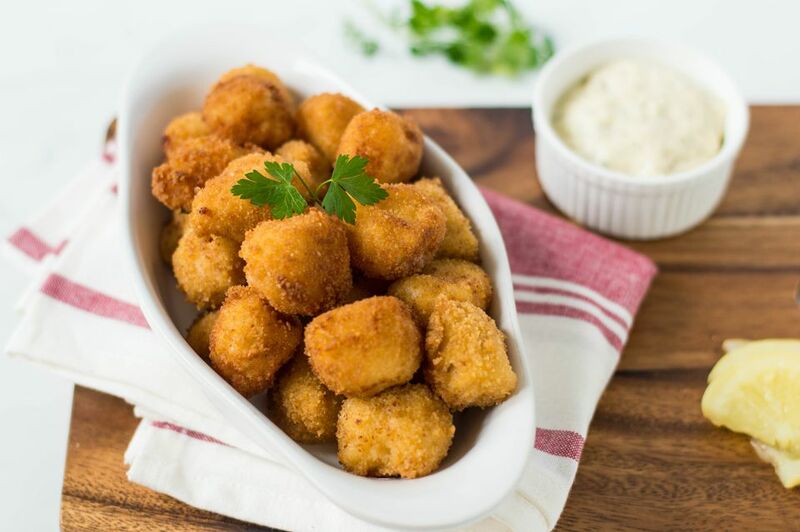 The deep fryer is an excellent way to cook scallops, and this recipe is an easy preparation. The scallops are first dipped in a seasoned flour mixture, then they are dipped in egg batter and dry bread crumbs. For more in-depth cooking tips and variations for alternative seasonings, cooking tips, and a quick tartar sauce perfect for dipping, see below the recipe. If scallops are quite large, cut them so the sizes are fairly uniform. Rinse the scallops under cold water and pat them dry with paper towels. Remove the tough white side muscle if not already removed. Heat about 2 to 3 inches of vegetable oil in a deep, heavy cast iron skillet, saucepan, or deep fryer to 350 F.
Line a baking pan or baking sheet with two or three thicknesses of paper towels and set aside. In a bowl, combine flour, salt, and paprika. In another bowl, whisk eggs with the milk. Put the fine breadcrumbs in a third bowl. Dip a few of the scallops in the seasoned flour mixture, then in the egg mixture, and then roll them in the breadcrumbs to coat. Repeat with the remaining scallops. Once the oil has reached the temperature (350 F), add several scallops -- about 6 to 10 depending on the pan size -- to the hot oil and fry until golden brown, about 1 1/2 to 2 minutes. Take care not to overcook. They should be warm in the middle, but still moist. Remove them from the oil with a metal slotted spoon and transfer them to the paper-towel-lined pan. Shake the pan gently for a few seconds so the scallops roll around and excess oil is absorbed. Serve immediately with your choice of cocktail sauce, remoulade sauce, or tartar sauce (see below). Don't crowd the scallops in the pan. Crowding will make the oil cool down significantly, and the scallop coating will end up absorbing more oil. Make a quick homemade tartar sauce by combining 2/3 cup of mayonnaise with 1/4 cup of finely chopped sweet bread and butter pickles and 1 tablespoon of lemon juice. Cover and chill until serving time. For more ideas, take a look at this recipe for spicy seared scallops or try these bay scallops with garlic. Use 1 1/2 teaspoons of Old Bay Seasoning to replace the salt and paprika. Spice the scallops up with a pinch of cayenne pepper, or reduce the salt to 1/2 teaspoon and add about 1 teaspoon of Cajun or Creole seasoning. Use garlic seasoned fine dry bread crumbs for the coating.